Whether you are a seafood or steak lover, Cape Cod restaurants are sure to please. In the mood for some mouth watering fresh lobster, drizzled with warm garlic butter? Go ahead, you're on vacation, I won't tell. Or maybe some b-b-q chicken, marinated and then grilled in a nice hickory smoked bath? Maybe a little corn on the cob on the side? The Cape is known for its seafood for sure, but Cape Cod restaurants offer so much more than that. Sometimes you just want a nice fresh, juicy grilled burger with all the fixings or some hearty authentic pasta instead. I am one of the few people out there that doesn't like seafood. I know, that's sacrilegious on the Cape right? Don't worry though, my family loves seafood so I can tell you who has the best shrimp or lobster if that's your cup of tea. 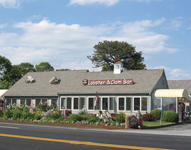 If you have been to Cape Cod a few times, I'm sure you've been to this Cape Cod restaurant. If you haven't been yet, or if you are heading to the Cape for your first time, this is a "must go" destination. This cool, surfer hangout is at the top of Cahoon Hollow Beach and has both indoor, and outdoor seating. They have a really popular "raw bar" and other types of seafood. I usually order the burger here and it is one of the best I've ever tasted. Their nachos are also really tasty. The outdoor seating area at this Cape Cod restaurant is always packed with surfers and locals (and tourists in the know) who head there for a cold beer after a long day at the beach. Sometimes, there are long waits to get in so it's best to arrive mid-afternoon.They also have really good local and New England bands that perform throughout the summer playing reggae, rock, and every other music genre. Directions: From Route 6, take Cahoon Hollow Road. The long, winding road takes you past some great swimming holes and Kettle Ponds. At the end of Cahoon Hollow, cross over the road and enter the driveway that winds down a hill into the small parking lot.When it's busy, there will be someone directing traffic at the top of the hill. This Bar and Restaurant is located at the Hyannis Marina and is always very busy. They have a "raw bar" and some really good seafood and meat dishes. Since they are located at the marina, you can come by boat. Directions: From Main Street east, take either Bayview or Lewis Bay Rod to Willow Street, to the marina on Arlington Street. We found this place by accident about 7 years ago and it is where we eat lunch every year when we go shopping in Hyannis. The locals call it "B2" and it is a great dine-in or take-out mexican place. They have a huge variety of burritos and they are really big and filling. Directions: From the rotary at the Barnstable Airport, take Iyannough Road. They are opposite the Cape Cod Mall at 790 Iyannough Road. In the heart of Provincetown, this tiny take-out place offers huge burritos at a great price. We usually order a black bean burrito that we have to split. There are no seats at this Cape Cod restaurant but if you walk through this building you will see other shops and then it opens up to a large outdoor deck overlooking Provincetown Harbor. Lots of places to eat and chill there. Directions: Park at the far end of Provincetown and walk down Commercial street (main drag in P-Town. Located at 205 Commercial Street on the water side. Hidden away inside a cozy house down an alley behind Commercial Street, this Cape Cod restaurant is where a lot of locals go so you know it's good. We found this place by accident too while we were on a wait list somewhere else. There was no wait so we ate here instead and I was glad we did. They even have these really romantic tables inside their wine cellar and there is a huge fireplace in another room. They have a patio but it was raining the day we went and was too chilly to be outside. They are known for their creative, fresh pasta dishes and appetizers. Directions: They are located at 4 Kiley Court, behind 430 Commercial St. in Provincetown's East End, between Bangs Street and Lovett's Court. Look for the crushed shell driveway. This Harwich, Cape Cod restaurant has fine Italian food and one of the better wine lists on Cape Cod. I was impressed in particular with the selections of wines by the glass. Buca's is very expensive so I would consider this place only for a special treat. Directions: At the corner of Route 28 and (#4) Depot Road in Harwich, near the Chatham-Harwich line. (one mile from intersection of Rt 137 and Rt 28. Authentic Sicilian - Italian cuisine and fresh seafood are on the menu at the Orleans restaurant. The inside of the place is nondescript but the patio is very lovely. The food is awesome and not too expensive. We originally found this Cape Cod restaurant after a local had recommended it to us. Directions: Follow Rt 6 to the Rotary and follow signs to RT 6A Orleans Center. Stay on 6A for eight tenths of a mile. Immediately after Citgo gas station and before the traffic lights at Main Street, turn left on Cove Road. Rosina's Café is located on the right side. Long name, authentic pit-style smoked BBQ. For some reason, it's hard to find good BBQ on Cape Cod. This place has a huge meat lover's menu which includes pork ribs, pulled pork, pulled beef brisket, pulled chicken, lobsters,clam bakes, prime rib, steaks, fish and chips and steamers. < b> 545 Rte 6, in South Wellfleet. Another hard thing to find on Cape Cod are good Chinese buffets. This place rocks! We eat here at least once every trip. They have a huge place with lots of tables and booths. There is never a wait but it's always busy. They have a lot of seafood in the buffet so you get your money's worth. They have a really good General Tso chicken and sesame chicken which I usually fill up on. Directions: If you are in Orleans, take 6A (Cranberry Highway) through Orleans. The restaurant is on your left just past where you go under Route 6. It's hard to find if you don't know where you are going so use your GPS if you have one. The street address is 225 Cranberry Hwy. Don't want to dress up to go out and get some great seafood? This Cape Cod restaurant is where you go if you want seafood without the fancy furnishings. 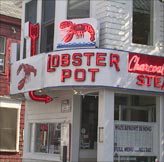 Perhaps the most photographed of all Cape Cod restaurants, this neon signed fixture of Provincetown's Commercial Street, is where you can get just about any type of seafood you want. They have won all sorts of awards over the years for their menu and they don't disappoint. Directions: You can't miss this place in the heart of Commercial Street. Hands down, these are the best fried clams on the Cape. Everytime I drive by this place on Route 6, it is packed! Expect to wait over an hour for a table at this Cape Cod restaurant and bring earplugs. This place is so noisy. The prices are a bit steep compared to other places (with better decor and ambiance) but still, it keeps them coming back for more. 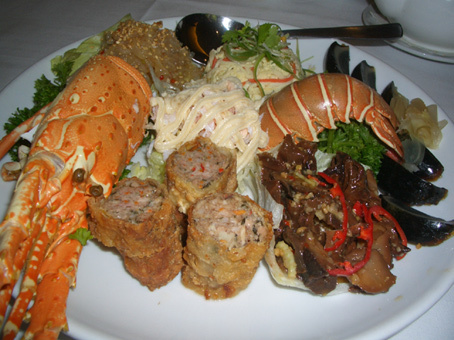 The seafood is some of the freshest you will taste. < b> It's right on Route 6 in Eastham, you can't miss it. This Wellfleet seafood restaurant and Raw Bar is a fancy Cape Cod restaurant that also offers excellent prime rib and vegetarian selections. Really good frozen cocktails after a day on the beach. Directions: They are located at 1019 State Hwy (Rte 6), opposite Marconi Station. This is truly a unique dining experience. Set in a house in Orleans, this fine dining establishment offers the best in Mediterranean food. The dining room is very intimate with candles in hand-painted Moroccan tea glasses. The wine list is very extensive (and expensive), as are the food items. This is definitely an expensive night out, best saved for a special occasion but the food is some of the best you will find at any Cape Cod restaurant. Such fare include: Duck Breast with Gnocchi & Broccolini in a Saté Sauce, and Wild King Salmon with Cauliflower Potato Purée, Baby Bok Choy & Zucchini in a Honey Ginger Sauce. < b> Take Exit 12 off of route 6. Head East of the Cranberry Hwy (6A) and turn left on Eldredge Park Way, then left onto Old Colony Way. They are located at 89 Old Colony Way in Orleans. 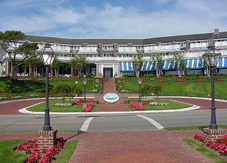 The restaurant, set in the Chatham Bars Inn (in Chatham), is one of the more expensive Cape Cod restaurants around. There are four restaurants: the Main Dining Room offers panoramic views of the spectacular Atlantic Ocean, where seasonal New England seafood is the specialty. Enjoy a cocktail and appetizers at the massive old-style bar at the Tavern, or pull up a fireside table and enjoy hearty New England favourites. The Beach House Grill, located on the water's edge, is a unique indoor/outdoor restaurant that is family-friendly, while the South Lounge offers traditional afternoon tea. We tried the afternoon tea at the Chatham Bars Inn one November afternoon. The South Lounge at Chatham Bars Inn was the perfect setting for our leisurely afternoon tea, with a generous and varied menu of finger sandwiches, tea breads, cakes, savories and home-baked goodies all served with the finest teas and infusions. The afternoon tea set came with lobster salad, scones with Devonshire cream and choice of tea. The cost was US$22 per person. Directions: From Route 6 take Exit 11 (Route 137 Chatham/Brewster), take a left off the ramp onto Route 137 South, go straight through two sets of lights (by car dealership), go straight at the four way stop at Queen Anne Road (country store on corner), continue to the Route 28 intersection (the road will end). Take a left onto Route 28 and travel approximately 3 miles to the Main Street Rotary. Continue half way around the rotary onto Main Street, pass Chatham Hardware on the left and take the next left onto Seaview Street. 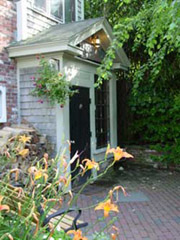 The entrance to Chatham Bars Inn is on the right just past the golf course. As one of the more distinguished Cape Cod restaurants, the Captain Linnell House in Orleans, offers a series of intimate and romantic dining rooms. Expertly prepared classic fare is the order of the day here – from appetizers of iced Wellfleet oysters on the half shell, to escargots and baby spinach salad, to entrees of rack of lamb, grilled salmon, roast duckling and pork tenderloins. Directions: Take Route 6 to Exit 12. Turn towards Orleans, stay in left lane. Turn left on West Road at the first set of lights. Continue one mile to a stop sign. Bear left, and restaurant is 1/4 mile on left at 137 Skaket Beach Road. This Eastham restaurant is where we fuel up for a day of surfing and sunning on the beach. They have an All You Can Eat Breakfast Buffet that includes homemade cinnamon rolls, scones and carrot cake, scrambled eggs, vegetable frittatas with goat cheese, and Tony's own homemade sausage gravy with hot biscuits, Applewood smoked bacon, pancakes and waffles, bagel bar with assorted toppings including smoked salmon with thinly sliced red onions, fresh fruit and yogurt and granola and much more. This is where you go when you are hungry. The breakfast is quite filling and will last you all day. 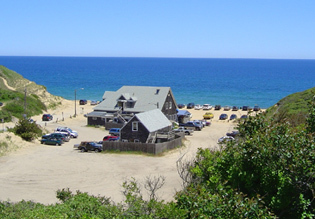 Directions: Located on Route 6, beside the Blue Dolphin Inn, just before you reach the Wellfleet town line. This breakfast only Cape Cod restaurant has an extensive breakfast buffet daily in-season; off-season weekends only. It is open year-round and has locations in Hyannis and Dennisport.Very inexpensive and a good bargain. Directions: Located right on Main Street (#521) in Hyannis and also right on Route 28 (#605) in Dennisport. 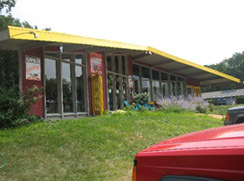 This Dennis restaurant offers an all day breakfast from 7:00 a.m. - 2:00 p.m. This breakfast only Cape Cod restaurant offers a wide variety of menu items including pancakes, french toast, baked goods, fresh juices, make-your-own omelets, and even a kid's menu. Directions: They are located right on Route 28 (#675) in West Dennis.